Hi Everyone! 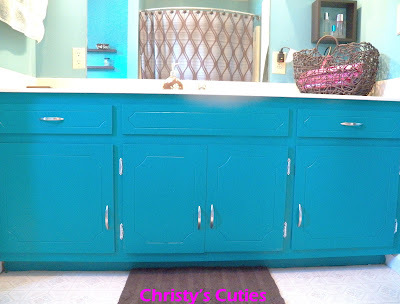 My name is Christy, and I blog over on Christy's Cuties. I am so excited to be here on A Glimpse Inside today! Allison's blog was one of the first that I found when I began blogging, and I immediately felt a connection with her because I am a Miliary wife as well. I want to show you the master bath redo I just finished, for under $45. We have lived in this house for 5 years now, and this room is the only one that has not been touched in any form until now. I really wish I remembered to take before, before pictures. There was an awful boarder up around the top of the walls as well. I know you all are sad you didn't get to see that beautiful boarder, maybe next time. The hardware on the cabinets were old and gold. The fixtures in the room were old and gold. Stock cabinets. And mustard yellow on the walls. It was old and out dated. Which meant it had to go. When I decided it was time to get started, I emailed my bloggy buddy Maury over at Life on Mars. If you haven't seen her blog, please check it out. 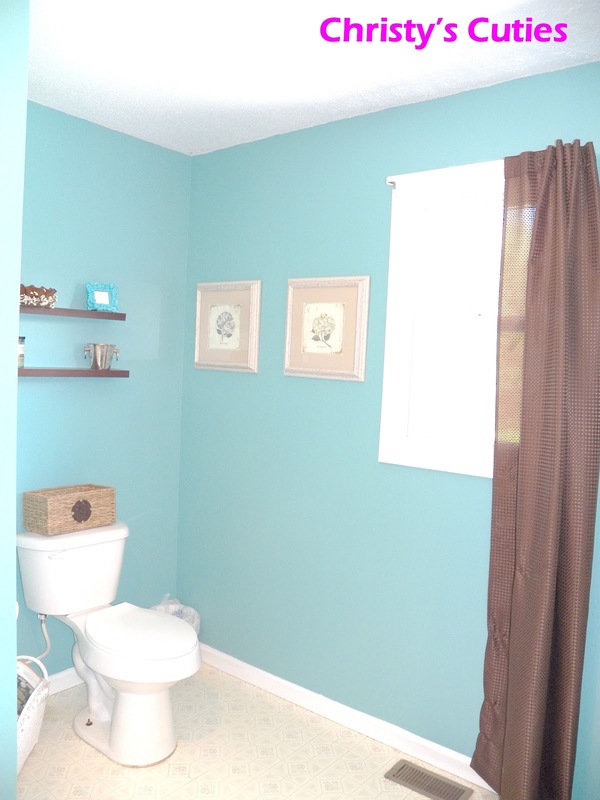 Maury has such an eye for colors and room re-do's. She's amazing! After asking a few questions, I told Maury the colors I was looking at painting and asked her opinion. She got back to me almost immediately and sent me some awesome color ideas! Being in the Military we do not really know when our time here is up, so I knew I didn't want to put a whole lot of money into the bathroom since we may be leaving next year. Knowing this I decided to just paint everything I could, and that's what I did. I couldn't be happier with the colors that I chose. The cabinets took less than a quart of paint, and that includes the outside and inside of the cabinets. I used Satin for both the walls and cabinets. Since I didn't want to buy new hardware, I just spray painted everything with Krylon Metallic. It went on perfectly, and is holding up beautifully. 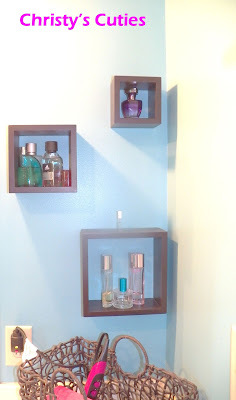 I found these three wood square shelves at Goodwill for $6.99 and thought they would be perfect to get our perfume and cologne off of the counter. They fit perfectly! The basket on the counter holds my blow dryer, curling iron, and straightener. I like it accessible, but hate having the cords laying all over the counters. This works great. 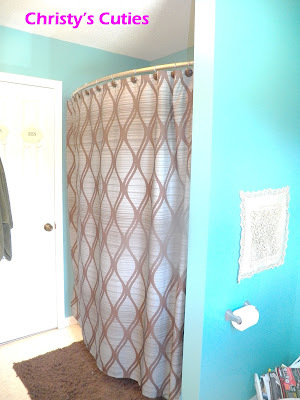 I already had the shower curtain. It was purchased a few years ago at Linens N Things. I also already had all of the wall decor, curtain, and rugs that you see as well. I just shopped my home. 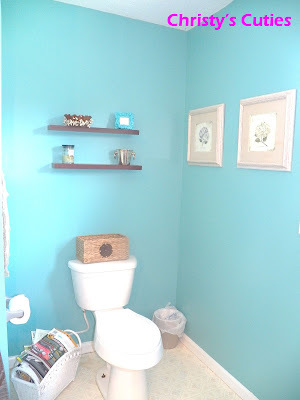 It's amazing what you can find in other areas of your home that will work better in another room. Since I didn't want to put money into the fixtures I used a metallic paint from the Americana line at Hobby Lobby. 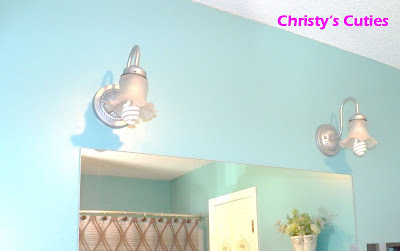 I used this on my lights, towel wall rack, and toilet paper holder. It took three coats each, but looks good as new. For such a cheap fix, they look great. I couldn't be happier with my decision to do that, rather than spend money to replace them. I hope you all like it as much as I do. I hope the husband likes it, too. He isn't home from his trip yet, and had no idea I was going to do this. HA! I'm social! 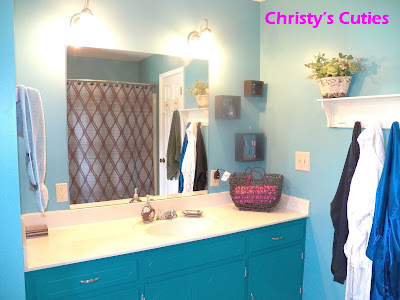 You can keep in touch with me on Twitter, Facebook, Pinterest, and even Instagram under Christy's Cuties if you would like. 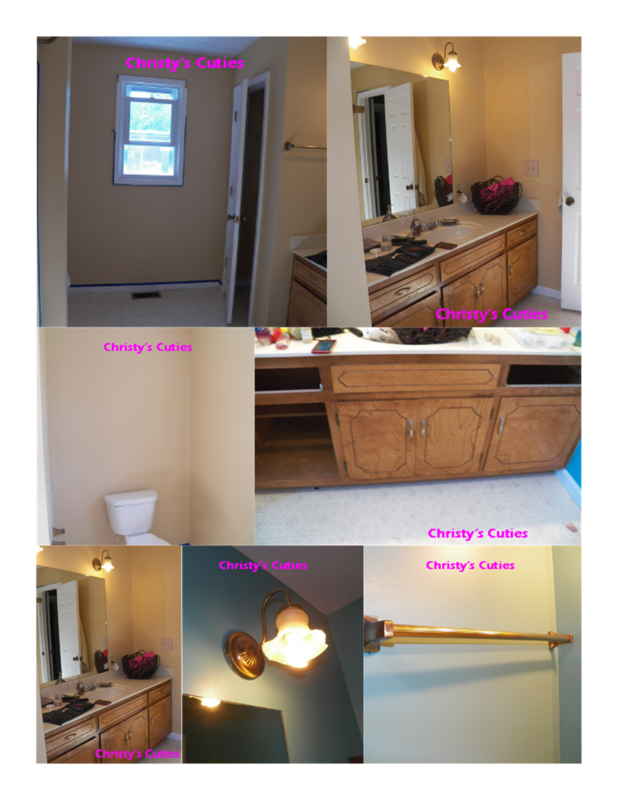 And of course I would love for you to stop by Christy's Cuties and look around, if you get a minute. Thanks so much for having me, Allison! I have had a great time. 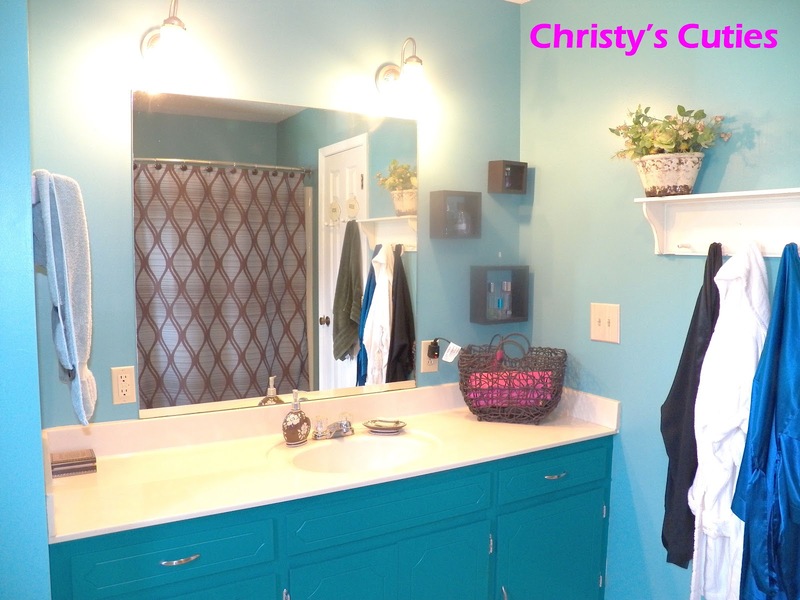 Thanks so much for sharing Christy! It looks great!! WOW $45 that's what I call a budget renovation.So much change for so little money. You should enter it in a competition somewhere!